The local Michaels Arts & Crafts here has a stand near the cash registers holding only $1 ribbon; and this isn't just cheap ribbon. I found grosgrains, embroidered ribbon, wired ribbon, etc. Here's the stack I came home with last week...and all for a dollar per spool if you can believe it! 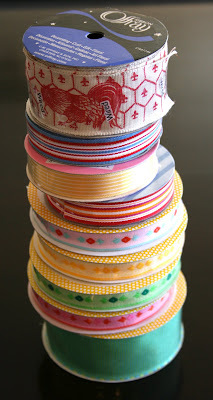 My Mike's has the biggest bin with these really wonderful $1 ribbon spools too. Most of them are leftovers from custom jobs, but you really get alot on the roll. Thick, lovely, high quality...so true.